Don’t let the oil spill distract Obama from fixing the economy. WASHINGTON--The oil spill in the Gulf of Mexico has created a double bind for the Obama administration. How it deals with a challenge even more complicated than it looks will determine the kind of summer the president has and the kind of election the Democrats will face this fall. The obvious problem is how the administration can get ahead of a disaster that promises to be a running story for much of the year. White House aides admit that they mishandled the public side of the event even as they insist that from the moment the oil rig exploded, President Obama was deploying resources on a large scale and preparing for the worst possibilities. They say they got the statecraft right but the stagecraft wrong. "Nobody can look at the response and say we were slow in doing what we were doing," senior adviser David Axelrod said in an interview. He pointed to a "whole range of steps" Obama "took right from the beginning." But he added: "We didn't communicate it well." Axelrod offers a long list of facts and figures to back up his portrait of an administration on top of things. What's not in doubt is that the Obama team's failure to explain what it was doing, to have someone speaking authoritatively about its plans, and to engage the president more visibly early on, all helped feed a media narrative no leader wants to face--a public argument over whether his predicament more closely resembles Hurricane Katrina or the Iran hostage crisis. But this is where the double bind comes in. The temptation now will be to react in a way that encourages a single-minded focus on the gulf disaster. Some of this is inevitable: Having been slow to explain what they were doing, the president's lieutenants have every interest in filling the airwaves with action and pronouncements that stress focus, determination and empathy. Yet the simple truth is that the most important issue facing the nation is not the oil spill, however horrific its effects will be, but the economy. And last Friday's job numbers, while positive in theory, were nonetheless disappointing. In May, the nation added 431,000 jobs, the largest monthly gain in over a decade, and the unemployment rate fell to 9.7 percent from 9.9 percent. But almost all of the job creation came from short-term hiring for the 2010 census. Private employers added only 41,000 jobs, below expectations and far below the 218,000 jobs added in April. In a careful but candid assessment to the new figures, Christina Romer, the chair of the Council of Economic Advisers, noted that "the continued high level of unemployment and the slowdown in private sector job growth emphasize the need for continuing vigilance." She underscored the urgency of "targeted actions to spur private sector job creation and prevent continued reductions in state and local government employment." Her comments pointed to another of the administration's communications dilemmas. Because of polls showing rising concern about federal deficits, it has been harder and harder to muster support, even among Democrats, for further actions to boost a still sluggish recovery. Obama himself has spoken often of his passionate concern about the long-term deficit and appointed a commission whose very existence highlights the problem. The trouble is that all of the president's talk about red ink undercuts support for the short-term spending measures that even his most deficit-conscious advisers know the economy needs. It's devilishly difficult to explain why deficits are good now and bad later. When a Democratic Congress has to pare back a job creation bill to get enough votes to pass it--and can't find $23 billion to save the jobs of up to 300,000 teachers facing layoffs--advocates of further stimulus have to know they are losing the political argument. Thus Obama's test: He needs to establish that he is doing all he can to repair the damage in the gulf even as he maintains his focus on the economy and persuades reluctant conservative Democrats that the job of ending the downturn is not yet done. 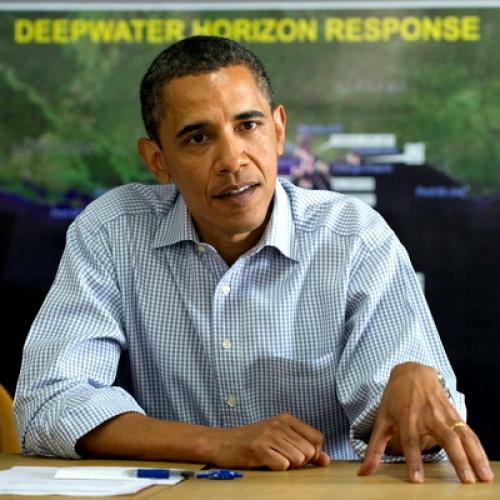 However unfair the first impressions of Obama's response to the oil spill may be, he can't afford to let them stand. He also can't afford to let oily waters engulf his priorities. It's worth remembering that while the daily countdown on the Iran hostage crisis helped create a famous television show, it was an unruly economy that ultimately upended Jimmy Carter's presidency. E.J. Dionne, Jr. is the author of the recently published Souled Out: Reclaiming Faith and Politics After the Religious Right. He is a Washington Post columnist, a senior fellow at the Brookings Institution, and a professor at Georgetown University.